Not all plus-size jeans are created the same. With unique hemlines, washes, and distressing, our guide will help you find denim that fits your personality perfectly. Here at Dia, we love denim, so much so, that we believe denim works every day of the week. 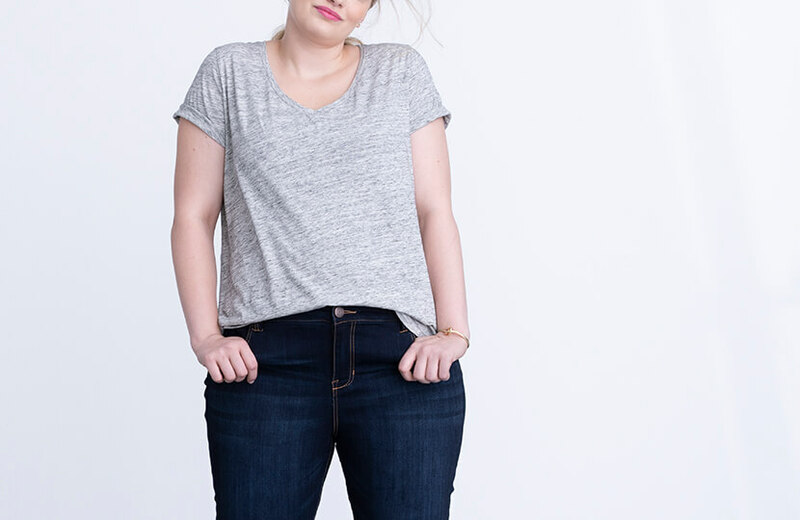 Shopping for plus size jeans used to be a chore thanks to poorly lit dressing rooms, few plus size shopping options, and disappointingly unstylish denim, but thanks to Dia&Co’s try-on-at-home method, your stylist can pick out jeans that fit your shape and preferences perfectly without you having to deal with dressing room drama. Do you know your preferences when it comes to wearing jeans? From lighter washes to playful embellishments, our guide will help you define the denim features you love so you can let your stylist know how to find you jeans that you’ll love. Not sure what denim silhouettes work best with your shape? Check out our guide to denim silhouettes before you put in your denim request from your Dia Stylist. 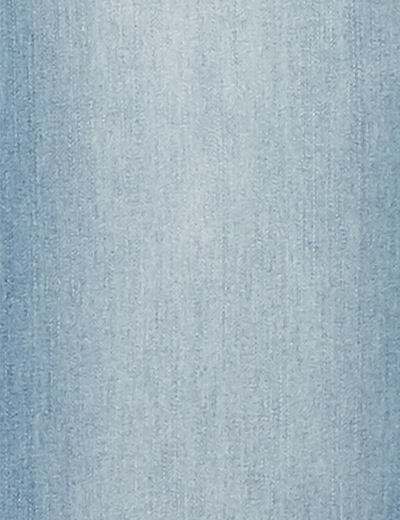 When we think of summer denim, we often think light wash. Light wash jeans are generally less saturated with blue dye than medium or dark wash jeans are. Often lighter in weight, light wash denim is the perfect pick for a summer day. Looking to break up the regular denim rotation in your drawer? Try a light wash or white jeans. These picks are a great alternative to your everyday pair of jeans, and since they’re a bit harder to dress up than their darker counterparts, light wash jeans are a great option for anyone who identifies their style as casual. 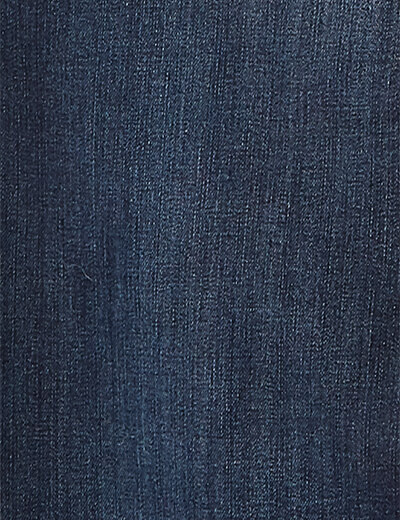 A medium wash jean is the classic wash we picture when blue jeans come to mind. It strikes a great balance—they’re not so dark and saturated, but they’re not so light either. 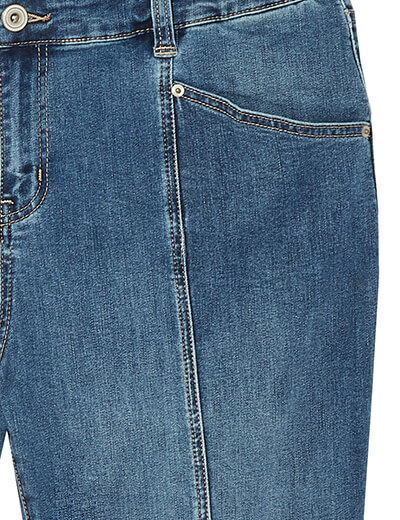 It’s the Goldilocks of denim washes, and, therefore, extremely versatile. No matter the time of year or the top you pair it with, a medium wash jean is always a good idea. Medium wash denim can be worn extremely casually or dressed up for a more formal feel. A pair of jeans in a dark wash is perfect for those more sophisticated outfits and special occasions. A dark wash jean can also visually elongate your legs, making them perfect to be worn with heels and platforms. Dark wash denim is a great option if your office dress code allows for jeans, provided it’s dressed up with the right top and accessories. The hemline of your jeans is the very bottom part of the pant, where your ankle meets your denim. While a traditional hem is sewed and secured, frayed hems are all the rage right now. Here are a few of our favorites. Many jeans are purposefully left with an unfinished look to give off a fun, frayed texture. 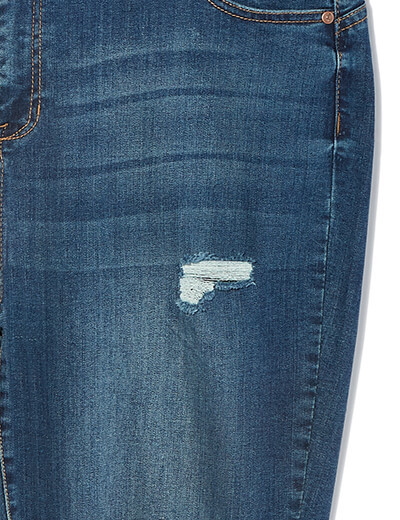 A frayed hem looks as if someone ran a pair of scissors across the bottom of a jean leg. Some of them are cut at an angle for an asymmetrical look, while others are cut shorter in the front than the back for a high-low look (or step hem). More often than not, jeans with a frayed hem are ankle length or shorter. Have a pair of old denim that doesn’t sit quite right? Cut off the bottom few inches of each pant leg to transform it into a trendy pair of ankle jeans or turn your too-short bootcut jeans into ankle kick flares! 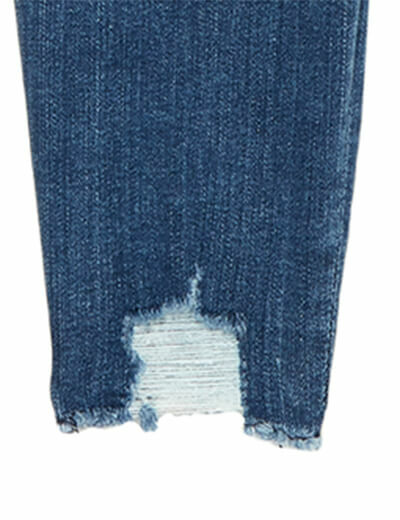 The asymmetrical frayed hem is cut at an angle, changing the shape of the jeans at the bottom for a more curved look. Yes, the cut is purposeful and the jeans are sold new with this detail—but you can also pull out a pair of fabric scissors and transform your old skinny jeans into a pair with an asymmetrical hem. While the look is supposed to be asymmetrical, make sure the treatment on each pant leg is the same so the look doesn’t appear lopsided. The released-hem detail looks as if someone let the hem out. Traditionally, most jeans have a finished hem where the fabric is folded at the base and then sewn together at the bottom before it gets dyed. A released hem is an intentional hem that looks like someone used a seam ripper. You can even see the dye details that are generally hidden in the fold. A lot of the functional details that we’ve come to know and love about our denim date back to the 19th century, when denim was introduced to miners and cowboys who were in need of sturdier pants. But as new trends are introduced, denim gets a trendy update, too! Those little round metal studs that you find near the pockets of your jeans? They’re called rivets. 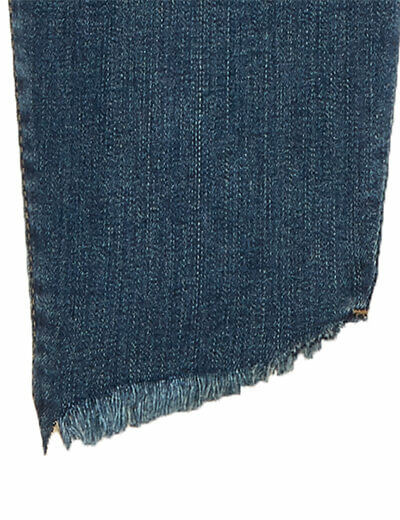 They were originally developed to keep jeans from falling apart under the harsh conditions of intense physical labor and extreme climates gold rush miners had to work in. Today, rivets have become commonplace in denim production and continue to help keep your favorite pair of jeans from coming apart. 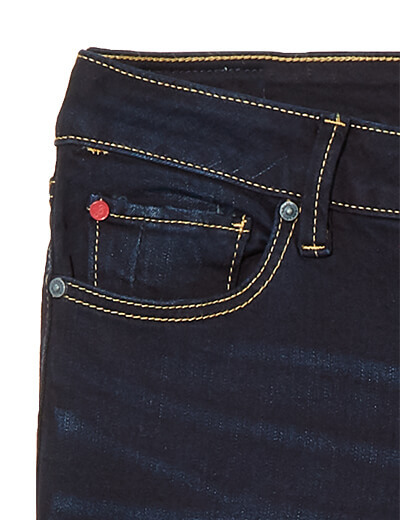 You may have heard the term “5-pocket jean,” and wondered, “What’s that fifth pocket for?” Most jeans have two pockets in the back and two in the front, but many also feature an additional coin pocket that sits within the front pocket. While originally this pocket was designed to house pocket watches for those wild west cowboys and miners of the 1800s, it’s more commonly used today to stash coins, matches, tickets, or whatever other tiny items you need to keep close. Back when denim was first introduced to the ’49ers who were in need of sturdy pants, whiskering did not exist on new jeans. Instead, it developed as these miners and cowboys would wear and re-wear their jeans without washing, forming creases from bending at the hip. Dirt and grime would then get into the creases, and the constant re-wear would make the jeans develop a detail where the creases changed color. 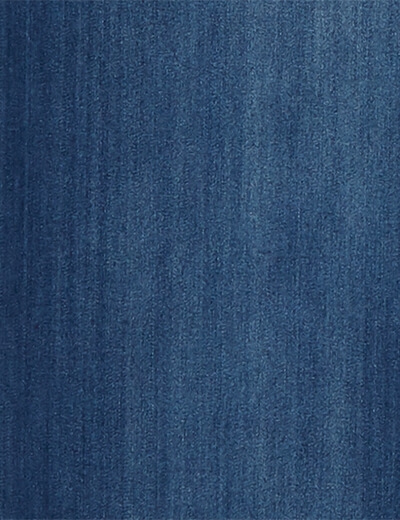 Today, most denim whiskering is developed by a machine to give the jeans the impression of a worn-in feel. While jeans in a variety of washes and silhouettes are a classic part of what makes up the perfect wardrobe, jeans become much less timeless when they feature playful embellishments like the studs or embroidery from today’s trends. These embellishments help personalize your jeans to make them feel special. If you have glam style, you may just love a pair of jeans with pearl embellishments. If you’re a boho babe, you might enjoy a pair of jeans featuring floral embroidery down the leg. Generally, the seams in denim (and most pants) run along the outside of the leg and up the inside of the leg. 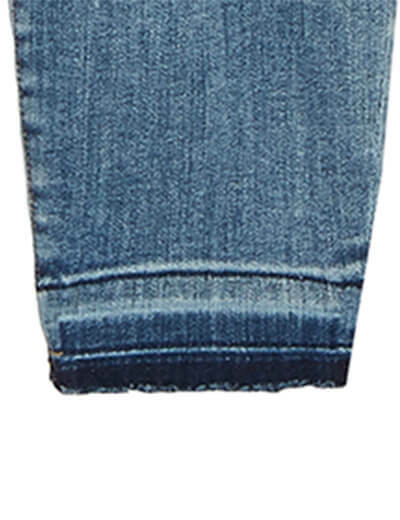 Lately, denim that features front seams that run up the center of each leg is trending. 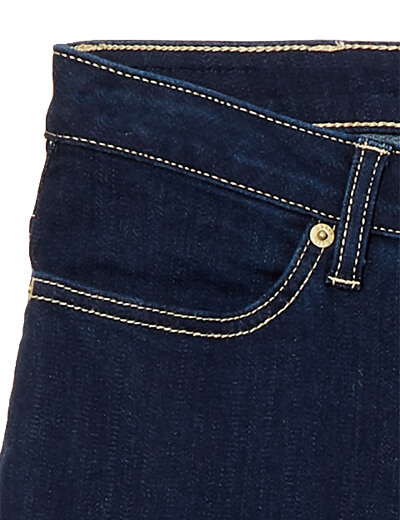 This line detail can visually elongate the legs and also help your jeans last a bit longer. Many of us who wear plus size denim find that when we walk, the inside seams can rub against each other, oftentimes resulting in jeans tearing. Front seams can reduce this effect and are totally on-trend for the season. Like whiskering, distressing used to be something that would develop over time due to regular wear and tear. However, distressing is now achieved by machine to give your new jeans that worn-in look. This makes your jeans feel a bit more casual too, so avoid wearing distressed jeans when you know you have a more formal gathering to dress for. So, have you determined the features you love about denim? Do you love whiskering details? Hate distressing? Make sure you let your Dia Stylist know your preferences so that your next Dia Style Box arrives with your new favorite pair of jeans! Once it arrives at your doorstep, be sure to show us how you rock your denim on social with #mydiastyle.